April 2014: Little Miss Separation Anxiety almost did herself in when I was in Europe. Thanks to VCA Castle Shannon Animal Hospital and their amazing ER staff, she made a full recovery! You will read the whole story later. Most of what you have read so far has all been adventures, fun and games. The adventures, fun and games continued on pretty much to the very end, but as time went on and Gabby got older she needed more medical care and attention to keep her going full speed. You will read about some of these experiences in the following chapters, and they may give you some insight as you take care of your own senior dog. I certainly had a lot of help taking care of Gabby, and she would not have lived as long as she did or enjoyed such a great life if not for the expert care of her doctors. I would like to take a moment to thank all of them here. Gabby’s first regular veterinarian was Dr. John Ruffing at VCA Castle Shannon Animal Hospital. 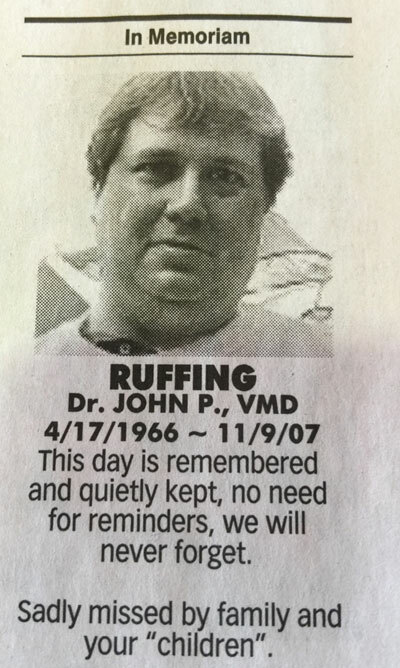 He was a warm, kind and caring man as well as a great veterinarian. When Gabby was young, Dr. Ruffing left VCA Castle Shannon Animal Hospital and we followed him to his new facility. We had no problems with VCA Castle Shannon, but we really wanted to stay with Dr. Ruffing. We stayed with his new facility for a while after his passing, but saw different veterinarians during her time there. I would like to thank all of them as well. Meadowlands Veterinary Center in Willoughby, Ohio: small but mighty! We discovered Dr. Robert Slobody and Meadowlands Veterinary Center when I sought out cryosurgery for a wart on Gabby’s muzzle. Over time he became our regular veterinarian, specifically after the toothpaste tube of (almost) death incident. He and his staff treated us like family throughout, and they still do. His facility is 136 miles from my home, but for a guy who loves to drive, that is nothing at all. I know his skill, techniques and the advanced technology at his center made a huge difference in her life. You will read more about it later in our story. VCA Castle Shannon stayed our emergency center throughout Gabby’s life and the doctors and staff there always did a wonderful job for us, pulling her back from the brink not once, but twice. When I bought a new house in 2012 I actually would not look in any area that was not within a quick drive of this place! If any of you are reading this, thank you so much! I would especially like to thank the lovely and talented Dr. Amanda Della Penna, who always took a special interest in Gabby and was always at the right place at the right time for us. She even bumped into me at the Wendy’s drive-thru when Gabby was sick! Big thanks also to Dr. Lopez, Dr. Hladio, Dr. Kachka, Dr. Zahniser, Dr. Iosev, Dr. Abdellah, Dr. Finn, and Dr. McGowan, as well as all the vet techs. Every one of them treated Gab at one time or another, and the teams who treated her when she was hospitalized did an unbelievable job.